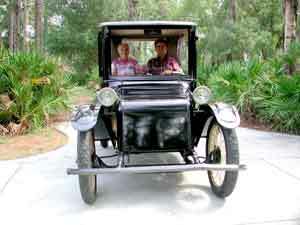 This site will provide a place for photos and information about "Milburn Light Electric" automobiles, which were produced for model years 1915 to 1923. This website was created by George Milburn of Sarasota, Florida and is currently maintained by Myles Twete of Portland, Oregon. Many folks have contributed information and pictures for this project, especially those with cars listed on the "Registry" page. Blanche Gordon, PO Box 6550 Thomasville, GA 31758 USA. 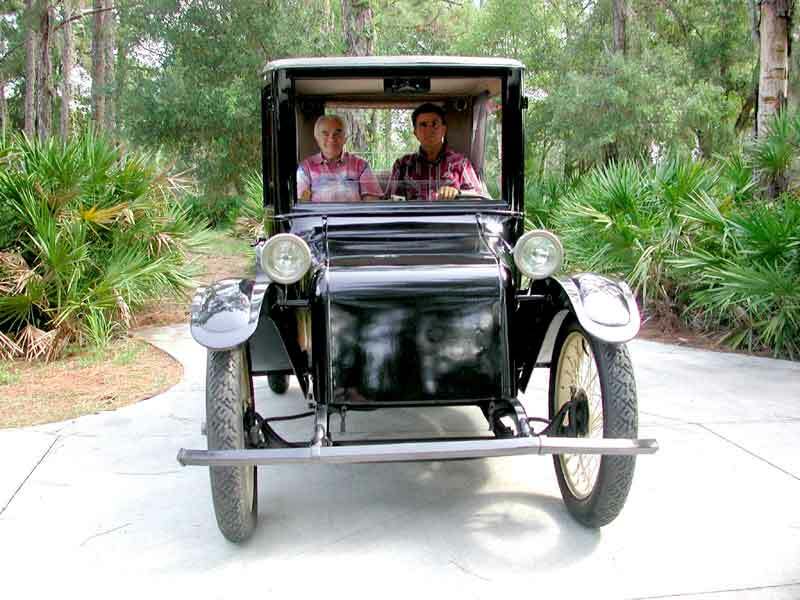 Another resource is the Antique Electric Vehicles List at YAHOO GROUPS, an online forum hosted by Myles Twete. One of the interesting challenges with vintage items is identifying physical attributes that distinguish and identify the actual age, year or model. This has been equally a challenge and rewarding with the Milburn Electrics. In recent years we have discovered several distinguishing characteristics. In addition to physical attributes, there are also several identifying ID's, date codes and actual dates found on these cars. These include Car# (or Car S/N or Chassis ID), Body#, Stewart Odometer Date Code, Sangamo amphour meter SN, Klaxon horn SN and Spring Date Stamp. Click on an image for a larger view. \ CAR S/N or Chassis ID#: Milburn identified car bodies separately from the car as a whole. 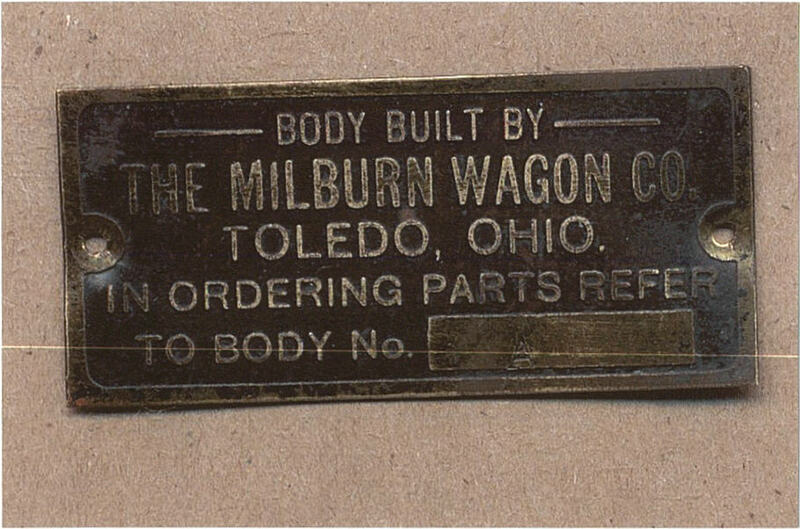 This likely stemmed from the fact that much of Milburn's business (both before and during the time they made electric cars) was as a car body manufacturer for Olds, Buick and perhaps others. And so, we find distinct Body ID numbers and car ID numbers. The car ID (or VIN) number should be stamped into a brass plate on every vehicle. On the Model 15 cars, the car ID plate has been found on top of the wood support under the rear seat. Model 22 and Model 27 cars also have been noted to have a plate under the seat or on the kickboard. With the Model 27L cars (S/N 2-900-7 and after), the S/N plate is an oval brass plate located at the rear of the car on top and in the center of the rearmost wood cross member under the battery tray----it is plain and has no writing, just the 2xxxx7 number. If we don't yet have your car S/N and you find a car S/N plate on the car, please email us the number and any photos you have of the stamping(s). If there is no plaque, the S/N is still marked on your car. Model 15 (and 22?) car S/N is also stamped into the chassis behind one of the front hood latches. Model 27(L) car S/N is stamped into the topside of the forward-most part of the right front spring knuckle on the chassis. Paint often fills this in and requires removal of the paint layers to reveal the number. Click on an image for a larger view. BODY ID#: Milburn stamped the Body# into the wood in 1 or more places on every car we have seen. One car (#2-2515-7) has a body ID plate (#16636) located on the rear cross member next to the car S/N oval plate. This co-location of the two likely is not original. At least one Model 27 has a "Chassis S/N" ID plate mounted on top of the front wood cross member under the back seat (see car #2-373-7). Some early Milburns (Model 15 or 22) have Body No. plates on the interior kickboard under the seat. 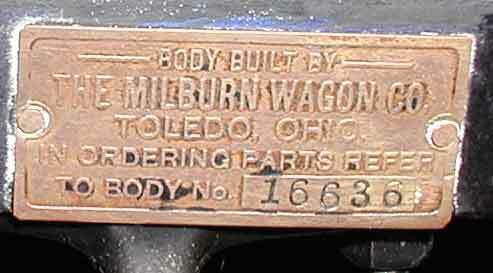 So far we have no indication that all Milburns had an actual body# plate attached. If your car has a body ID# plate, please email us the number stamped on it and tell us where it was found. If not, don't fret---all Milburn bodies have the Body No. stamped into the primary body elements including the doors (very top, seen from above), hoods (very bottom, seen from below) and main body (passenger side, forwardmost corner, top of wood sill plate under front hood area). Other places seen: Stamped into wood behind upholstery on the doors, also chalk marked on the wood behind the back seat. There may be more places. 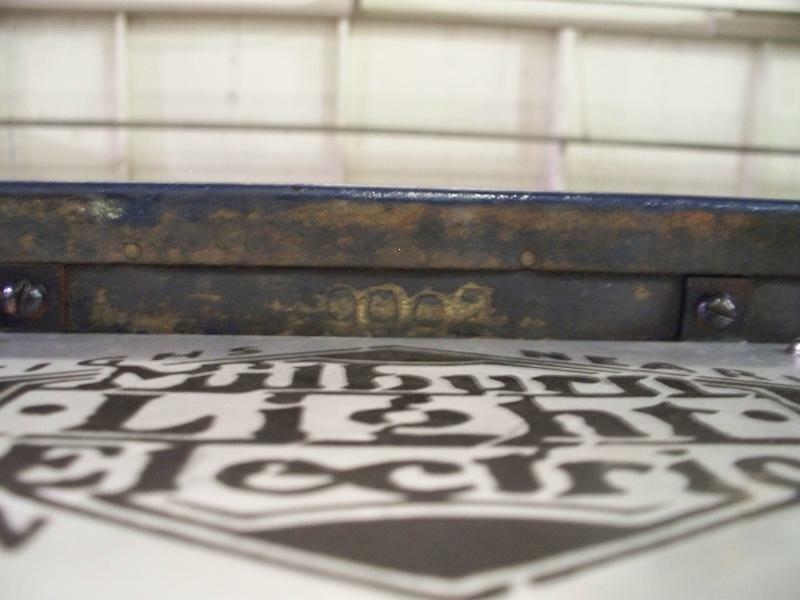 If we don't have your car's Body# yet, please email us the number and any photos you have of the stamping(s). Click on an image for a larger view. \ Suspension Spring Date Stamping(s): This one was just discovered (Spring 2019) whereby the right front leaf spring on one 1920 Milburn was found to have stamped into the topside "JUNE 1919". 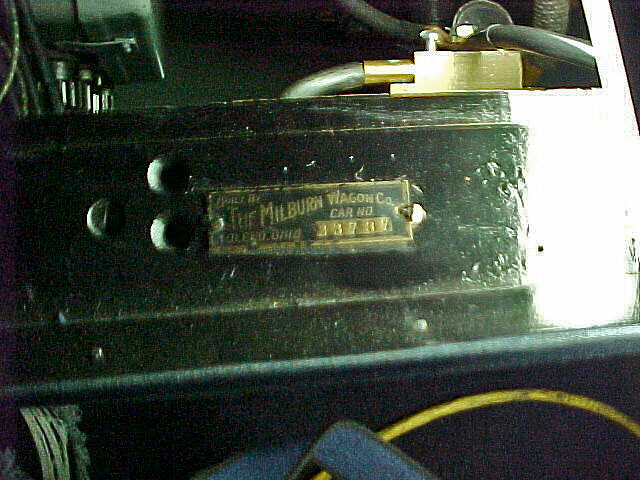 It is likely that all of the Milburn Model 27L cars have similar Date Stamps on at least the right front (passenger side) spring. The location of the stamping is near the spring bolt near the center of the spring, topside and under the topside clamp plate.